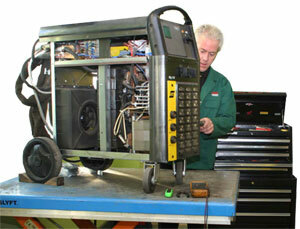 Engweld service and calibrate all makes of welding plant and equipment. Engweld are approved service agents for all leading brands of welding plant and associated equipment, offering full service and spares facilities from our main centres, both on or off site. Engweld's highly experienced and qualified team of engineers provide a fast turn around to keep our customers working. Working from purpose built service centres located in Hull and Sutton-in-Ashfield, offer full warranty, service, repair and spares backup. We also calibrate welders to BS EN 50504:2008 meeting ISO9000 requirements, either in our workshops or at your premises/site. Engweld offer dedicated servicing and repair contracts tailored to customers individual needs, with priority call-out, rapid response time, and scheduled servicing and calibration of your welding/cutting machines. All workshop repair costs are estimated prior to repair so you know exactly where you stand with both small and large repairs. On site repair service wherever possible. Repairs to all makes of welding machines including MIG, TIG, MMA, engine powered generators, submerged arc and plasma cutting & welding systems. Fixed price annual service and calibration/validation contracts (to British standards) providing automatic renewal. Machine modifications to suit individual needs. For more information or to book a service visit, please contact your local branch, or email us on service@engweld.co.uk. You can also contact our Service Manager, Glen, direct on 07773358542.